Feel free to use these icons anywhere on your website, blog, or even in print. I do not request that you give credits to me. However, it will be a nice gesture if you do give me a credit when these icons are used in your design(s). Looks so amazing! super like it. Thanks for sharing this. 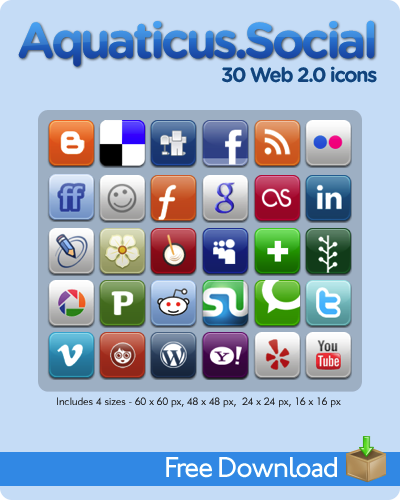 Aquaticus I just downloaded & faved the icons you gently share with us... thanks and good vibes dude!. Thank you so much for making these! They really come in handy! More icon love for my favorite icon set. This time I have made a Pinterest icon set. You grab it here [link] Thanks again for making and sharing this great icon set, plus the template. These icons are awesome! Already used them for a website project of mine. Thank you very much! Used these on my blog and credited at the bottom of my webpage, thank you! Thank you very much this means a lot to me! I've add the red Google+ Icon to the previous G+ icon. You can grab both here: [link] Thanks again for the great set! Thanks for creating and sharing your icons. I am using the set at my website and just recently created Google+ icon from your template. 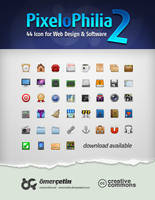 Read the article about my favorite icons- yours of course and download the icon [link] . 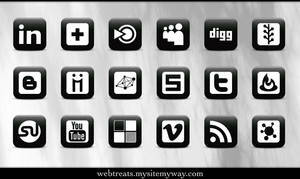 I'm using them, if we plan for an about page on our blog anytime, I will link a credit to your portfolio.. These icons are very useful. Excellent clean and refined icons - thanks so much for producing them - they're very helpful! Thanks for Good information, I Will Open again for your Website learn Good information. Thanks for great share. I used your template to create another icon [link] for the Spanish Quentin.com social network. I'm using on my blog. Thanks for great share. I used your template to create another icon [link] for the Spanish tuenti.com social network. Para los que utilizan tuenti.com!! Great work! I received your link from Ainsley Bevis' tutorial, Design a Bright & Fun Coming Soon Page. Thanks for sharing! My friend is using one of your links "LinkedIn" for her business website and would like to know how to edit and/or install a couple of icons that are not in your list above. I am assisting her with her website and would be more than happy to email her address to you once completed. Please advise. 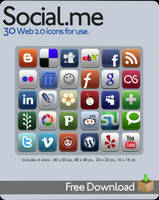 Can you please add a Formspring.me icon? may I use it in my theme that will be sold? Thanks much good sir, well done.